Enjoy a meal with a large group of family or friends when you extend your table with a butterfly leaf. Butterfly leaves are conveniently stored inside the table so you don’t have to worry about storing bulky pieces. Various sizes and quantities allow you to customize the space to fit your exact needs and when the party is over return your dining room to a size that suits your everyday life. Get extra space when you need it by utilizing the easy-to-store butterfly leaf or leaves included with this table. 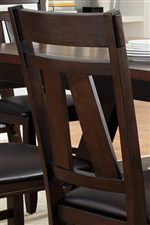 This six piece dining set features a rectangular dining table, splat back side chairs and a bench for an effortless way to update your dining room. With angled legs creating a built in shelf in the middle, this trestle table is a great addition to your home. With a two tone finish of a light espresso top and dark espresso base, this table goes great with the splat back side chairs. Easy glide system makes it a breeze to place the 12 inch butterfly leaf in allowing you to seat even more family or guests. The table top is protected from scratching and marring by a UV top coat, making it look good for a long time to come. The upholstered seat of the splat back chair provides comfort and style. With stretchers on the two sides and back tapered legs, these chairs look great in a transitional dining room paired with the trestle table to complete the set. The Lawson 6 Piece Rectangular Table Set by Liberty Furniture at SuperStore in the Williston, Burlington, VT area. Product availability may vary. Contact us for the most current availability on this product. 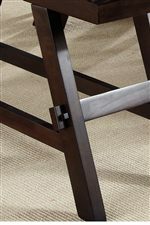 Finish & Paint Options Light and dark espresso finish with Chocolate PVC upholstery. Case Detail Angular legs, clean edges and dark espresso finish. Description: Top Table tops are protected by a UV top coat and finished in a light espresso finish. 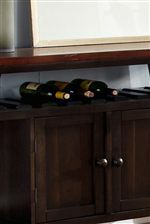 The Lawson collection is a great option if you are looking for Transitional furniture in the Williston, Burlington, VT area.